Wow. 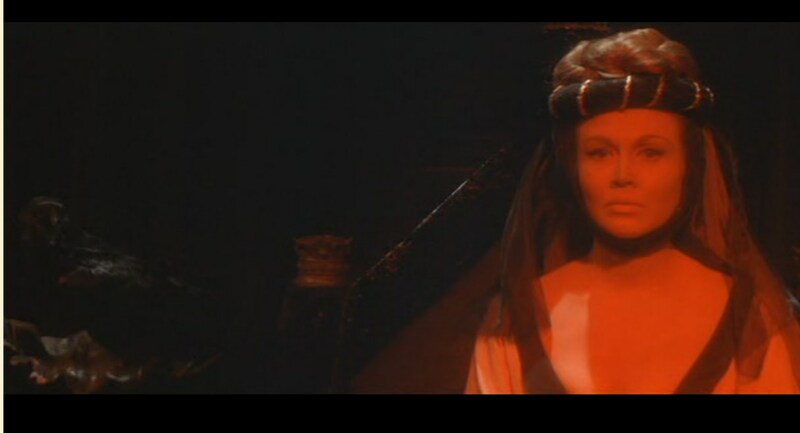 This ambitious film directed by Corman has actually stunned me. Watching the trailer beforehand, I was in a way dreading it as it looked cheesy and a bit ridiculous. Thankfully the movie itself was serious, artsy, and genuinely interesting. 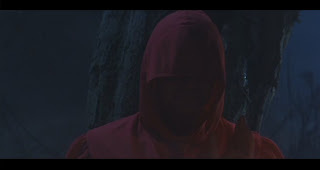 The flick opens with a woman in a graveyard receiving an ominous prophecy from a figure clad in red, who turns her white rose to his hue, and instructs her to tell everyone that the Red Death is here. She runs to the village, and apparently goes into the hut to, well, die, while the camera shoots to the arrival of the Prince. It's clear from the start he's a cruel ruler, and proceeds then to his castle, where he has now taken two prisoners for execution, and one woman who was begging for the prisoner's lives, which led to him being intrigued by her. While in the castle it's made clear that Prince Prospero is a an egocentric, cruel man who feels he can cheat death by remaining in the castle and because of his odd pact with - believe it or not, I'm serious - Satan. 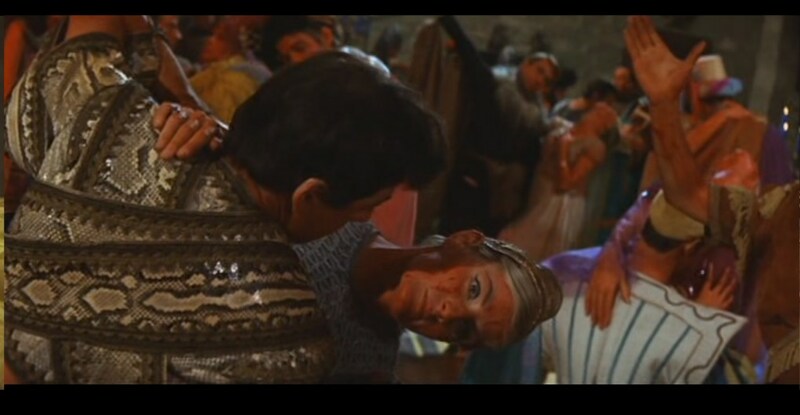 As cheesy as it sounds, Prospero's bizarre religion plays a big role in the movie. 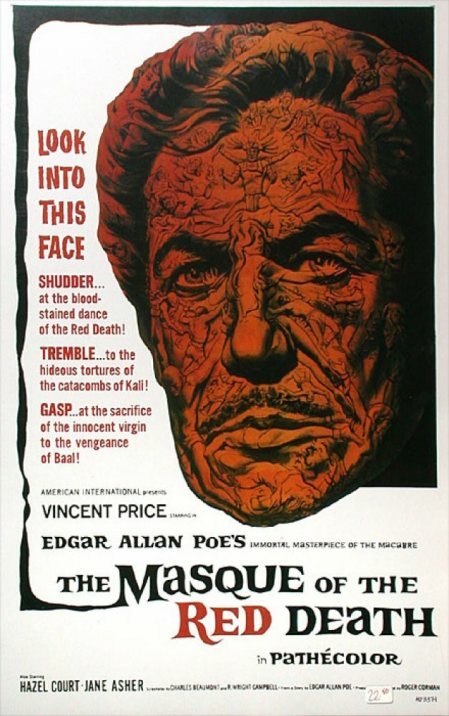 While Poe's short story only hinted (maybe) at religion with the last paragraph, this movie is filled with it. In today's time this would make a movie less enjoyable. In the sixties though, it was a shock appeal that would have worked well to horrify the audience. Whether the idea is cheesy or not, it does lead to interesting lines recited by Price about God, faith, hope, and the falling of man. The corruption of the innocent, or attempting of it, of the young woman Francesca (Jane Asher) and the driving urgency of the wife and princess, Juliana (Juliana) to become fully acceptable to Prince Prospero speaks volumes about his power over the people. His extreme confidence sends out a false sense of trust and security to castle's residents, the same with Poe's story as people blissfully danced around the own hours of their deaths. In the end of the film he even boasts that he has lured them to the false religion with fake promises because he had the power to do so through his surety and suggestion. There was a particularly disturbing scene where Prince Prospero displays his power by making some of his guests behave like animals, slithering on the floor while everyone laughs around them. Not only this, but he makes them do it AND enjoy their own humiliation, making their following an even lower low. This bizarre role would have only worked if it were pulled off perfectly, so Corman was genious in again assigning the difficult role to Vincent Price. His sinister presence and quiet charisma captivates the eyes and emotions of the audience easily. His character stands in clear opposition to the alluring innocence of Francesca and the villagers, who hold to their faith, their sense of honor and loyalty to fellow man, and their unwillingness to be easily corrupted. Even at the end when Francesca agrees to allow herself to be degraded, she does so only to save someone else, giving up her own honor in an unselfish act. Because of this, there's the ironic twist: is she really even giving up honor? If anything, her willingness to submit herself to darker forces and taint herself to serve a greater good only shows a three-dimensional quality to the character. Instead of being a doey-eyed, cliched innocent that emits melodrama and induces eye-rolls, she stands as a strong, courageous woman to be reckoned with, painted with convincing shades of grey instead of black and white cheapness. When I said above the movie is an artsy piece, I wasn't kidding. Especially at the end of the tale, when everyone is dancing to their delight of the ball, and Red Death enters to paint them the bloody color as he gives them the plague, they freeze, then keep dancing a graceful ball. It's almost ballet style and pieced with beautifully chilling music, superb acting and coordination all around. The theme of the film is dark and deep, while the pace is strong and swift, with the ending being a dramatic wrap-up. Atmosphere is heavy and gothic, accompanied by glamorous costumes and poetically powerful speech. Thankfully the film sticks with the colors of the short story, which was the most important thing of the story. They did change the black room A LOT, however, to serve the new religious additions. Instead of being a room to be shunned, it's a room embraced but for a much different purpose. Ignore the tacky trailer, this movie is worth watching if you're a fan of the story, a follower of Price, or a reader of Poe.